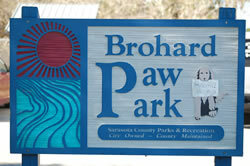 Brohard Beach is the place to be if you want to share the beach experience with your canine companion. There is an enclosed play yard with watering station near the parking area, and a pet-friendly section of the beach where your dog can swim and romp. Restrooms, hours 7am-Dusk. No Lifeguard on duty.